Just when you think that Pelgrane Press has made an awfully big bang with its re-energising of the d20 System and Dungeons & Dragons-style gaming in the form of 13th Age, it slips out another Class and Level d20 System RPG. One that is much smaller and one that is much more oddly named. Owl Hoot Trail promises to be “Rules-Light, Western-Heavy, and Full of Fantasy”. What Owl Hoot Trail is, is a stripped down d20 System RPG that takes as its setting the Wild West and adds many of the traditional elements of Dungeons & Dragons – Dwarves Hill Folk, Elves Shee, Halflings Half’ins, Humans, and Orcs, as well as Vampire Lords, Dragons, Harpies, Owlbears, and more. This is a Wild West in which the Shee live way out West, and in which Gunslingers, Marshals, Ruffians, and Scoundrels ride the range and mosey on up to the bar alongside Gadgeteers with their amazing inventions, Mentalists who command great magics, Preachers who bring both the word and the power of the Almighty, and Shaman entreat the spirits for their aid. The frontier is a wild place, but out on the Owl Hoot Trail, the heroes have a chance to tame it! To create a character in Owl Hoot Trail, a player selects a Race and an Origin, either a Greenhorn or a Native, and then a Class. Three points are assigned to three Abilities – Grit, how tough the character is, Draw, how fast, and Wits, how sharp. A character’s Race, Origin, and Class will determine any benefit to the game’s five skills – Amity, Learning, Toughness, Wile, and Wilderness, otherwise he has a score equal to his Level in all five skills. Each character also receives $100 ($150 if he is Human) to spend on equipment. Our sample character is a big, butch pistol-wielding Orc gunslinger with an ornery demeanour and an extreme dislike of liars and cheats. When she cannot rely on her gun, she likes to bring a big, heavy hammer to a fight. Both of her lower teeth are heavily cracked, hence her being labelled ‘ugly’. Skill tests involve adding a skill rank and an appropriate ability plus the result of a twenty-sided die roll to beat a Difficulty Class with DC 15 being the norm. For example, Amity + Wits would be used to notice lies or be persuasive, Toughness + Draw for dodging, wrestling a steer to the ground, or bull rushing an enemy, and so on. The possible combination of the three Abilities and five skills covers a lot of situations. The competitive rules cover gambling, whilst those for duels combine slightly modified initiative rules with the combat rules. The latter designed to be quick and easy, and potentially deadly. In particular, when a character’s Hit Points drop below zero or he suffers a Critical Hit, a roll must be made on the Injury Table, one of the results is instant death. All rounds fired in a duel count as Critical results! Magic in Owl Hoot Trail comes in four flavours. A Gageteer uses devices such as the Phosphorus Agitator and the Personal Ornithopter, which each time he uses one of them, they have a chance of burning out. A simple recharging of the batteries will give the Gadgeteer the use of the device once again, but this costs money and the Gadgeteer may want to spend time to recharge the batteries instead. In addition, the Gadgeteer has the Brilliant Improvisation ability which allows him to reconfigure his devices to allow him to use lesser effects. For example, Jackass Justice Blake has a multipurpose device capable of projecting a Pyromatic Seeking-Sphere, but suddenly caught in a mine without light the Gadgeteer reconfigures the device with his Brilliant Improvisation and holds the sphere of fire in place to use it as a Phosphorescence Agitator. The Shaman, capable of calling upon spirits such as the Spirit of the Tangling Thorn and Spears of the Earth, also has a similar chance of burnout for each spirit and must essentially placate the spirits to call upon them again. The Mentalist can cast Tricks like Hypnotic Pattern and Clairvoyance, whilst the Preacher has Prayers like Inspire and Create Food and Water. Instead of rolling for Burnout, it takes physical strain for both the Mentalist and the Preacher to use their Tricks and their Prayers respectively, that is, in game terms, they lose Hit Points! In addition, the Preacher can Rebuke sinners and his enemies with the Word of the Almighty, which might force them to surrender or to flee. All of these Classes – the Gadgeteer, the Mentalist, the Preacher, and the Shaman can have signature Powers of their players’ choice. Such Powers are more effective and are either easier to use or cause less strain. The sample Power user is a Gadgeteer, One Horse Randolph LaRue. A member of the Hillfolk from the South, he has come to the Frontier to prove that horses are redundant! Randolph hates horses as he is allergic to them. In addition to the cowpokes, cowpunchers, and bandits that the player characters are likely to encounter, the Frontier is home to untold numbers and types of critters. Some come straight out the Wild West genre – the Creek Demon, the Chupacabra, the Hangman Tree, and so on, whilst the Goblin, the Landshark, and the Owlbear come from Dungeons & Dragons. Others, like the Goliath Rat, Sand Dragon, and the Prairie Troll combine the genres. The monsters are nothing more than the bare boned stats, but there is pleasing advice on customising monsters to fit the GM’s Owl Hoot Trail game, including a good example using the Harpy. Elsewhere there is advice for players who have characters with Powers to roleplay their use of Gadgets, Prayers, Spirits, and Tricks as much as roll them. The advice for the GM is short and to the point, it also includes guidelines for setting the tone – ‘Damn Near Realistic’, ‘Horror And Wonder’, and ‘Magic, Like Dust’. The default tone for Owl Hoot Trail is ‘Horror And Wonder’, easily represented by the monsters in the Foes and Monsters chapter. Rounding out Owl Hoot Trail is ‘They Rode to Perdition’. Set in and around the town of Perdition, this is a surprisingly lengthy scenario that takes up half of the book! It includes a description of the town and its inhabitants as well as a three act scenario. As written, the town of Perdition is intended to be used after the scenario has been played. Physically, Owl Hoot Trail is a black and tan affair illustrated with line art, some of it used more than once. The book has a familiar look to it in its choice of typefaces and layout, the effect being to evoke the look of the West, but overall, Owl Hoot Trail is an easy read. Owl Hoot Trail is a succinct combination of the lovingly familiar – the familiarity of the Wild West, the familiarity of Dungeons & Dragons fantasy, and the familiarity of the d20 System. 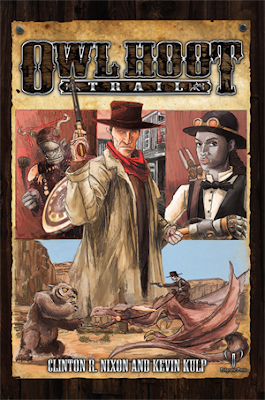 It brings the flavour and ‘Horror and Wonder’ – and plenty of it – of Dungeons & Dragons-style fantasy to the Wild West and keeps it light, cinematic, and flexible. The result is a laidback game that is easy to pick up and grasp, and quick to play and enjoy. Let us hope that Pelgrane Press will let us ride the Owl Hoot Trail again and out onto the range with further releases.